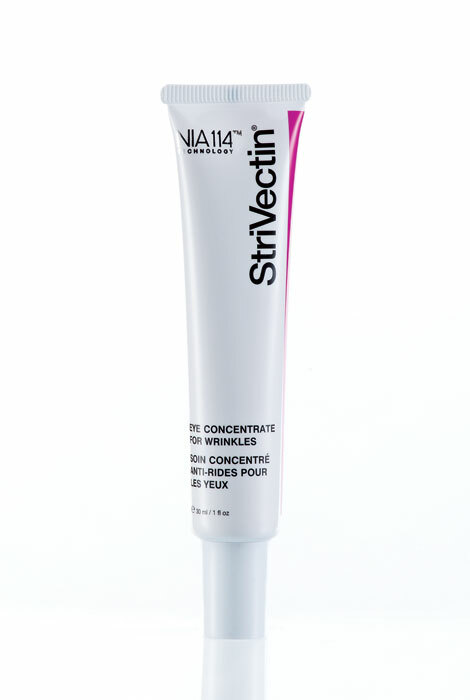 Strivectin-SD™ eye concentrate for wrinkles helps years disappear from your eyes. This rejuvenating anti-aging eye cream can be applied morning and night to visibly reduce circles and puffiness in two weeks, increase firmness in four, and fade fine lines in eight. 1 fl. oz. Water (Aqua/Eau), Myristyl Nicotinate, Cyclopentasiloxane, Caprylic/Capric Triglyceride, Glycerin, Isocetyl Stearate, C12-15 Alkyl Benzoate, Pentylene Glycol, Glyceryl Stearate, PEG-100 Stearate, Myristyl Myristate, Dimethicone, Ethylene/Acrylic Acid Copolymer, Butylene Glycol, Squalane, Cetearyl Alcohol, Arachidyl Alcohol, Caprylyl Glycol, Acrylamide/Sodium Acryloyldimethylt Aurate Copolymer, Phenoxyethanol, Panthenol, Isohexadecane, Caffeine, Behenyl Alcohol, Mica, CI 77891 (Titanium Dioxide), Benzyl Alcohol, Bisabolol, Arachidyl Glucoside, Xanthan Gum, Polysorbate 80, Dicetyl Phosphate, Ceteth-10 Phosphate, Sorbic Acid, Benzoic Acid, Synthetic Wax, Steareth-20, Chlorphenesin, Tetrasodium Edta, Aminomethyl Propanol, Algae Extract, Polymethyl Methacrylate, BHT, Sodium PCA, Urea, Ceramide 2, Malus Domestica Fruit Cell Culture Extract, Hesperidin Methyl Chalcone, Polyquaternium-51, Trehalose, Pullulan, Resveratrol, Hydrolyzed Hyaluronic Acid, C20-40 Pareth-10, Hydroxyethyl Behenamidopropyl Dimonium Chloride, Lecithin, N-Hydroxysuccinimide, CI 77491 (Iron Oxides), Polyquaternium-67, Triacetin, Sodium Hyaluronate, Ethylhexylglycerin, Tetrapeptide-21, Dipeptide-2, Palmitoyl Tetrapeptide-7, Phospholipids, Palmitoyl Oligopeptide, Chrysin, Lepidium Sativum (Sprout) Extract, Tetrahydro-Methyl-Methylpropyl-Pyran-4-ol, Phenethyl Alcohol, Methyldihydrojasmonate, Rosa Damascena Flower Extract, Alpha-Methyl-Alpha-Ionone, Isopropyl Myristate, Hexamethylindanopyran, Cucumis Sativus (Cucumber) Fruit Extract. Apply in the morning and at night on cleansed skin. Gently pat around orbital bone. The product is lightweight and does not bother my contacts at all. You only have to use a small dab for each eye so the tube will last a long time. i use this morning and night on my eyes and i believe i look great, women have been telling me l look younger, which makes me feel great. Love this stuff , i will keep using it forever. Used this product before and it really works. My friend is using them and I can see a big difference in her skin. used prev and it really does work!!!!!!!!! !